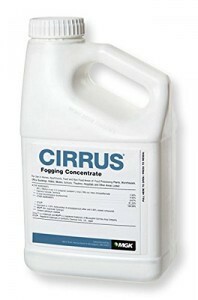 PRODUCT DESCRIPTION: Oil based concentrate which is mixed with deodorized oil and applied with a fogging machine. 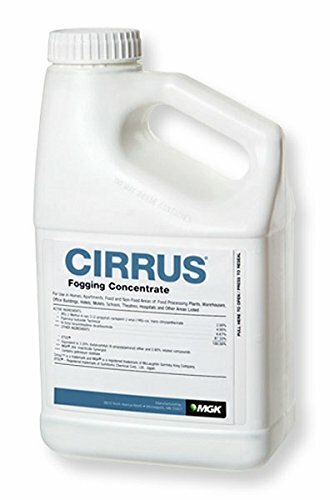 Commonly used in hot foggers like the GOLDEN EAGLE THERMAL FOGGER, Cirrus goes a long way and can be used outside and inside including federally inspected meat processing facilities and other food prep areas. RATE OF APPLICATION: Mix 4.5 oz per gallon of deodorized oil. TARGET PESTS: Almond Moths, Angoumois Grain Moths, Ants, Blister Beetles, Blood Sucking Boxelder Bugs, Cadelles, Carpet Beetles, Centipedes, Cereal Beetles, Cheese Mites, Cheese Skippers, Chocolate Moths, Cigarette Beetles, Clothes Moths, Cockroaches, Coffee Bean Weevils, Confused Flour Beetles, Crickets, Dark Mealworms, Darkling Beetles, Deer Flies, Dried Fruit Beetles, Drugstore Beetles, Earwigs, Face Flies, Firebrats, Fleas, Flies, Fruit Flies, Fungus Gnats, Gnats, Grain Mites, Granary Weevils, Harlequin Bugs, Hide Beetles, Horn Flies, Hornets, Indian Meal Moths, Khapra Beetles, Leaf Hoppers, Lesser Grain Borers, Mediterranean Flour Moths, Mosquitoes, Mushroom Flies, Red Flour Beetles, Rice Weevils, Rusty Grain Beetles, Saw-toothed Grain Beetles, Scorpions, Silverfish, Small Flying Moths, Spider Beetles, Spiders, Stable Flies, Stink Bugs, Tobacco Moths, Vinegar Flies, Warehouse Beetles, Wasps and Yellow Jackets.